The SAT (Scholastic Achievement Test) is a test designed to supplement the information that admissions officers receive when you apply to college (American universities). The SAT has three distinct section types distributed over nine independent timed sections. There is a tenth section which is used for research and development. There are three Writing sections: an essay, and two multiple-choice grammar-based sections. Grammar, meaning, diction and style are tested. Two sections are 25 minutes long, and the third is 10 minutes. The Writing is one hour of exam time and one third of the total score. The Reading portion is composed of two 25-minute sections and one 20-minute section which test vocabulary and reading comprehension skills. The texts are science, literature, and social sciences. The Reading is one hour and ten minutes in total and is one third of the total score. The math evaluation has three sections, with multiple-choice and student-generated responses. There are two 25-minute sections and one 20-minute section. The topics range from simple arithmetic to geometry and introductory level statistics. The math sections total one hour and ten minutes and constitute one third of the total score. If you want to go to college in the US, probably. The SAT is required by the vast majority of US undergraduate programs as part of the admissions process. Check the application requirements of the schools you are applying to. Some schools accept the alternative exam, the ACT, which we can prepare you for, depending on schedule constraints. You should definitely prepare for it, whether you choose to study on your own or take a course. 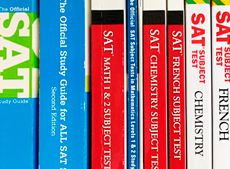 The SAT is a general exam covering math, grammar, vocabulary, and reading. Learn vocabulary! It is essential that you be familiar with the exam before you take it. You may not need to take a course to get the score you need, but taking this course has advantages. The course provides a complete review of the exam, focusing on each section through theory as well as sample questions. I have a degree in secondary education and have been preparing students for the SAT exam for nearly twenty years, so I know the SAT well. Classes are reduced in size so students get a lot of personal attention. Finally, we use all real exam materials in class.